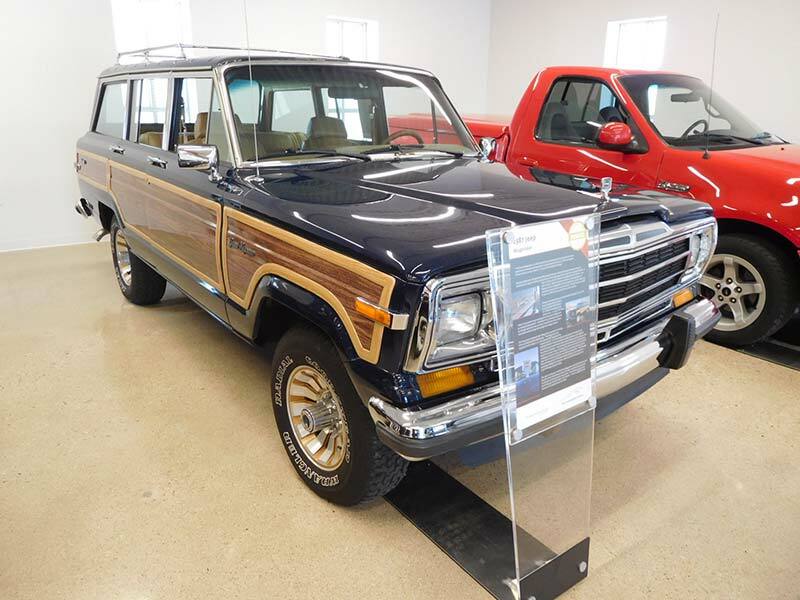 In 2017, The Los Angeles Times described the Jeep Grand Wagoneer as being “The ultimate expression of wealth and luxury among oilmen and gentleman farmers.” When it was new, the 1987 Grand Wagoneer featured in this article sold for $24,521. That would equate to about $75,000 in 2018 dollars. The Jeep Wagoneer was simply the first four-wheel-drive luxury vehicle. 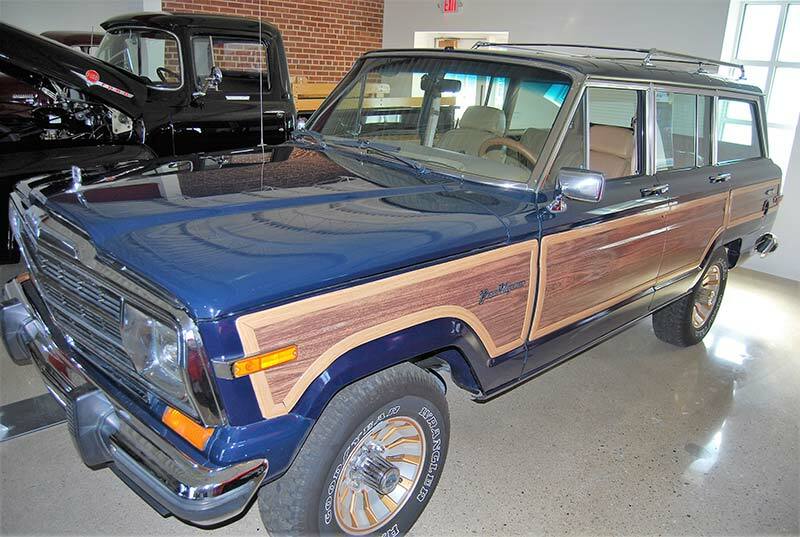 It was produced by a number of different manufacturers from Kaiser-Jeep to Chrysler between 1963 and 1991. 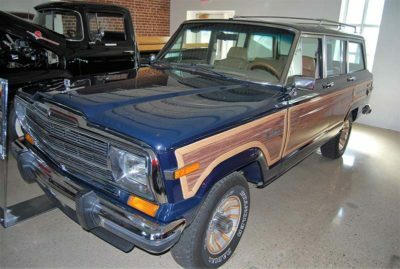 The Wagoneer saw only minor mechanical changes during its 28-year plus production run, which was the third longest run for a specific model in North America’s entire automotive history. The first Wagoneer of 1963 helped pioneer the sport utility vehicle concept. 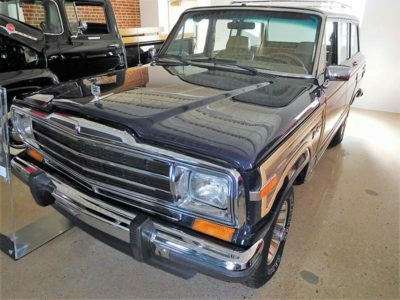 In spite of its pickup truck chassis and boxy shape, it was more car-like than any 4×4 on the market. 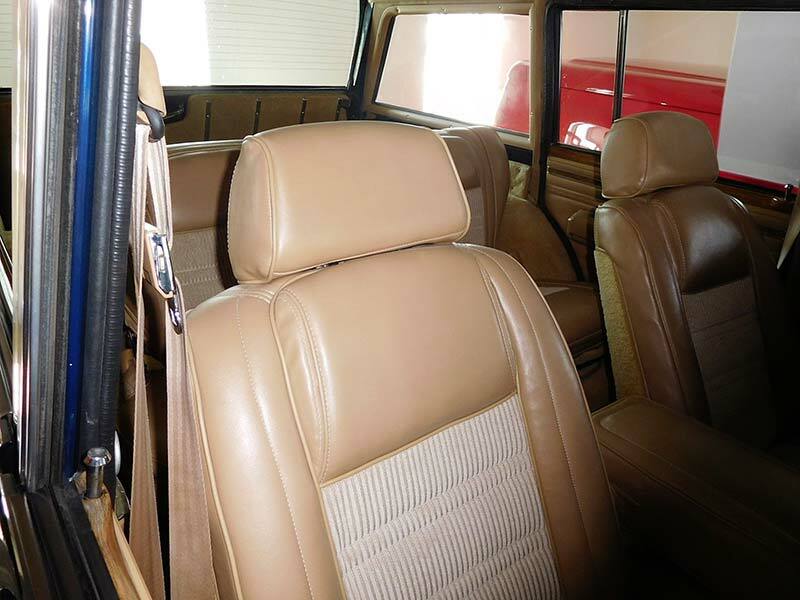 Contemporary 4x4s from General Motors, International Harvester and Land Rover were work-oriented utilitarian vehicles with spartan interiors. 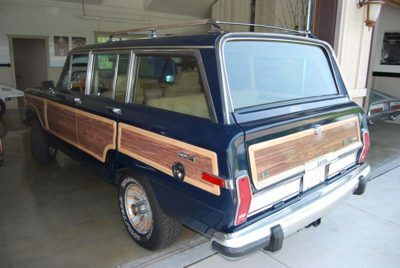 The Wagoneer had a luxury character that set it apart. The Wagoneer was based on the Jeep SJ platform and at first sported an advanced straight-six engine. 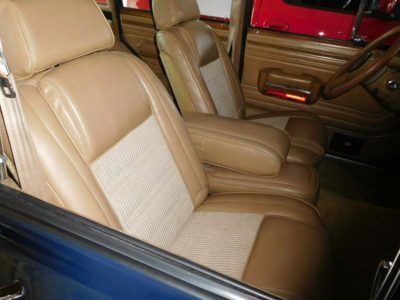 It offered features unheard of at the time in any other mainstream four-wheel-drive vehicle. 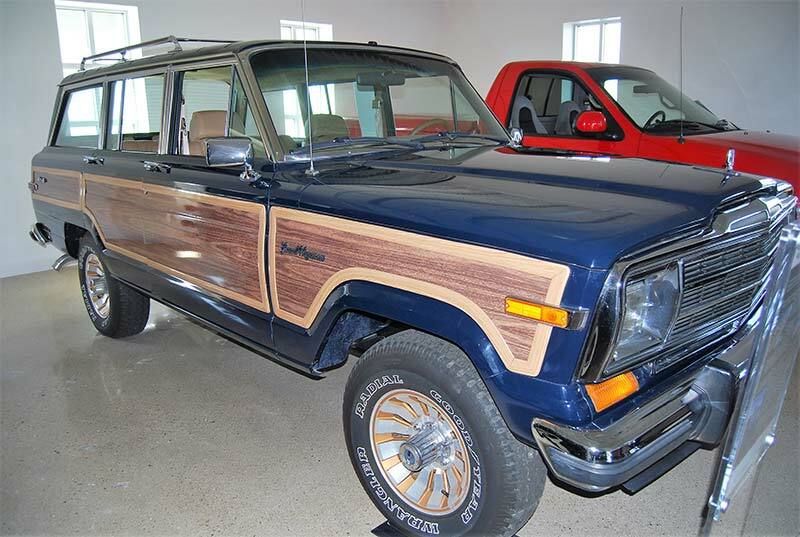 They included independent front suspension, power steering and automatic transmission. 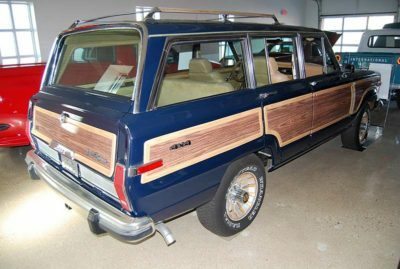 In 1981, the Wagoneer line was expanded to three models. There was a base Custom Wagoneer, a Brougham with upscale interior and exterior trim (such as a thin side-body scuff molding with a narrow wood grain insert) and the top-of-the-line Wagoneer Limited with standard Quadra-Trac; automatic transmission; air conditioning; tinted glass; power windows and door locks; cruise control; AM/FM stereo radio; extra quiet insulation; power six-way driver and passenger bucket seats with centre armrest; upgraded door panels; leather-wrapped steering wheel; extra-thick carpeting and retractable cargo cover. 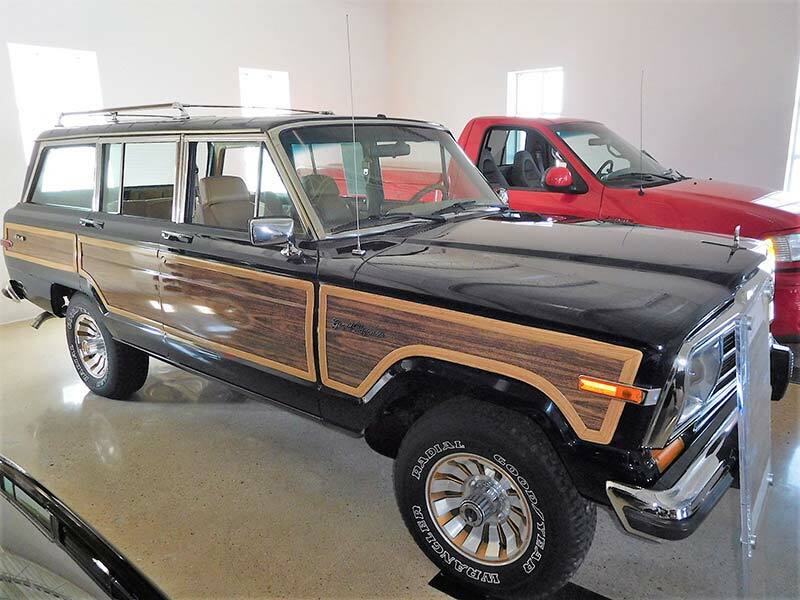 The Custom Wagoneer was eliminated in 1983 and a new Select-Trac system became standard equipment. 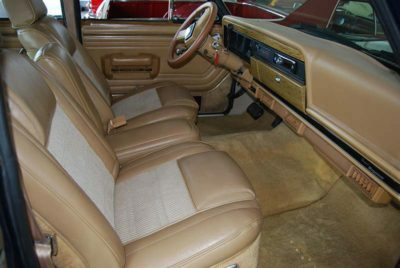 A dash-mounted control allowed the driver to change between two- and four-wheel drive. The switch activated a vacuum-activated spline clutch that was built into the front axle assembly. In 1984, the Wagoneer Brougham was dropped and the Limited became the Grand Wagoneer. 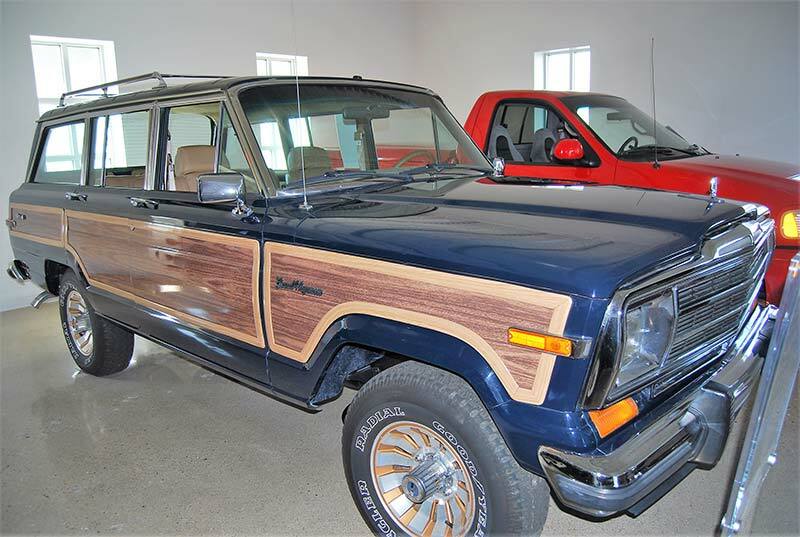 From then on, only one fully equipped version was available. 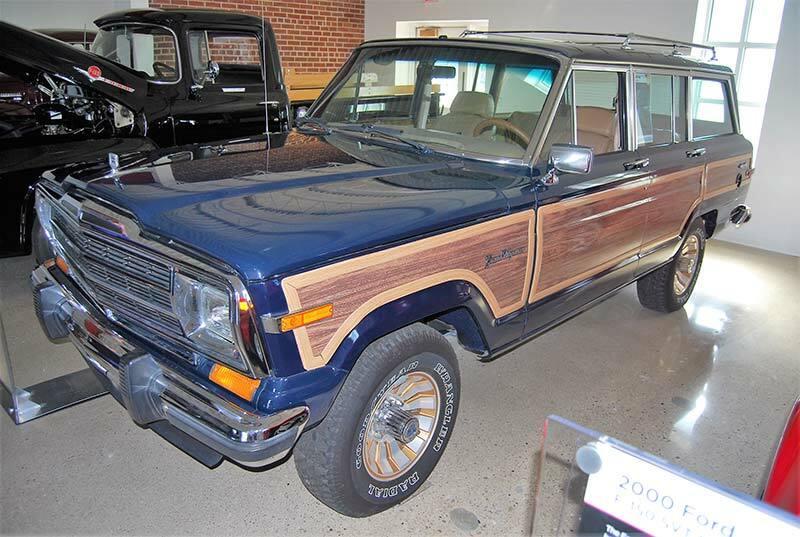 This would remain the case until the end of the Grand Wagoneer production under Chrysler. 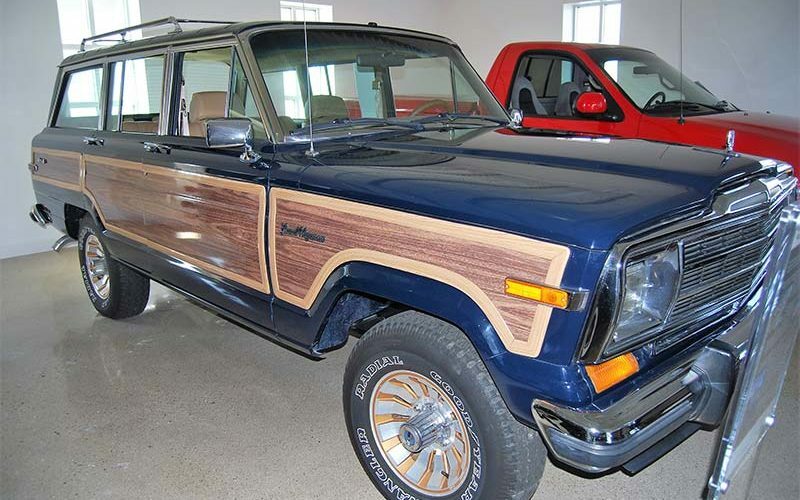 Production was 20,019 units in 1984. An improved handling package was introduced in 1985. 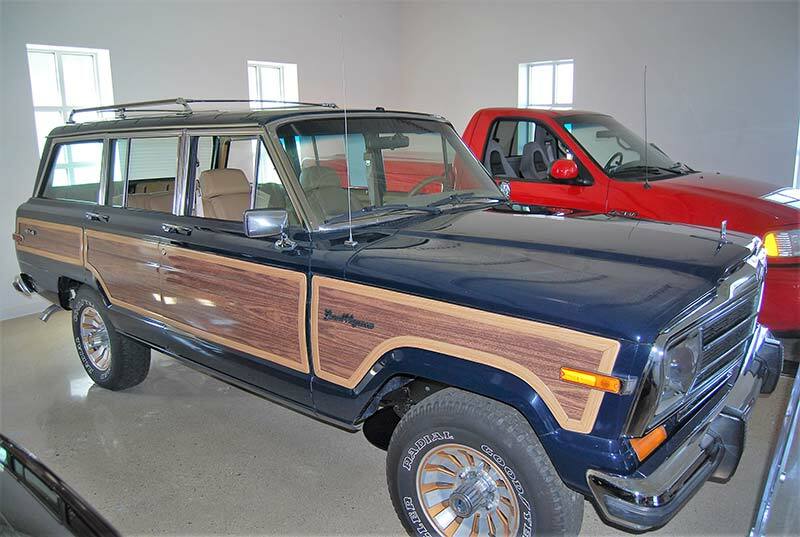 It incorporated a revised front sway bar, gas-filled shock absorbers and lower friction rear springs. 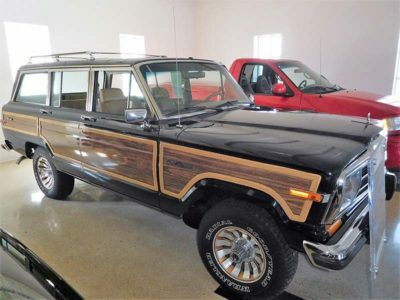 A total of 17,814 Grand Wagoneers were built for 1985. 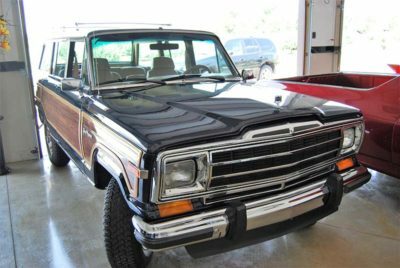 Starting in the 1986 model year, the Grand Wagoneer received a new four-part front grille and a stand-up hood ornament. 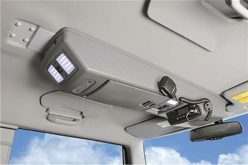 An updated audio system became a standard feature and a power sunroof, installed by American Sunroof Corporation, became a factory option. However, the most significant change was the installation of a fully revamped interior including a new dashpad, new instrumentation, new door panel design, shorter nap cut-pile carpeting, new leather seat cover designs and front seats that featured adjustable head restraints. Changes were made to the instrument panel that now featured square gauges and wood grain overlays and contained an improved climate control system. 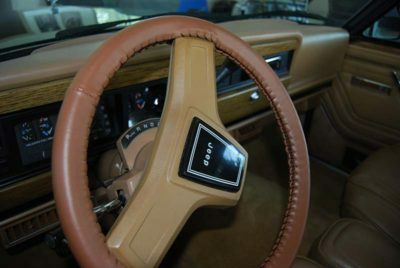 A new two-spoke steering wheel also included new stalks for the lights and wiper and washer controls on the column. 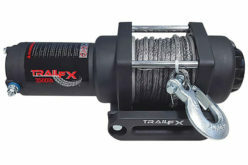 The Select-Trac driveline gained a new Trac-Lok limited-slip differential to send power to the wheel with the best traction. There were 17,254 Grand Wagoneers built in 1986. The year 1987 was the 25th anniversary of the Wagoneer. It was also the last year for an AMC Grand Wagoneer as Chrysler took over at midyear. Standard equipment included a 360 cu. in. (5.9L) V8 and self-sealing Michelin “Tru Seal” P235/75R-15 radial tires. The sound system included a new AM/FM electronically-tuned stereo with Dolby cassette and four Jensen speakers. 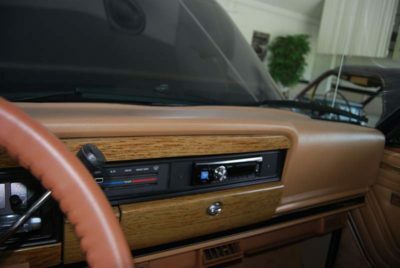 The exterior featured revised wood-grained sides in “marine teak” with new nameplates and V8 badges. On the inside were new tan or cordovan trims that replaced honey and garnet colours. 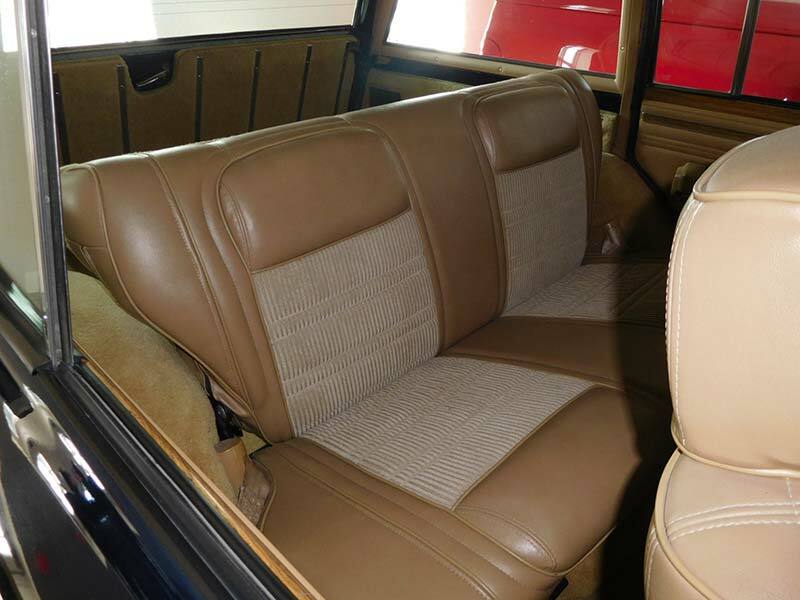 Interior assist pulls on the door panels were removed. 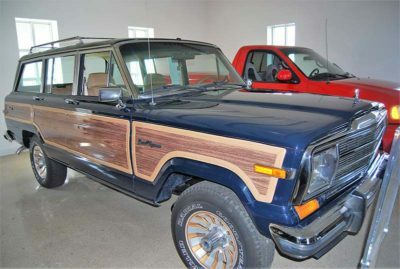 A combined 14,265 units was built by AMC and Chrysler for 1987. 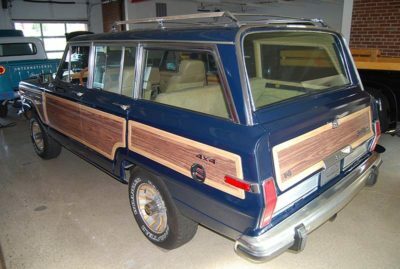 Standard equipment for late AMC Grand Wagoneers included: all-season radial tires; 15-inch alloy wheels; AM/FM stereo with cassette player; four AccuSound by Jensen premium speakers; air conditioning and heater with manual controls; dual front power bucket seats; a leather-wrapped steering wheel; leather and velour seating surfaces; a digital quartz dashboard clock; a full-size glove box; a roof rack with roof rails; a chrome front grille with hood ornament; front fog driving lamps; power windows and power door locks; an adjustable tilt steering column; dual-note high-low-pitch horns; a power rear hatch window; tinted windows and vinyl faux wood body side panels. 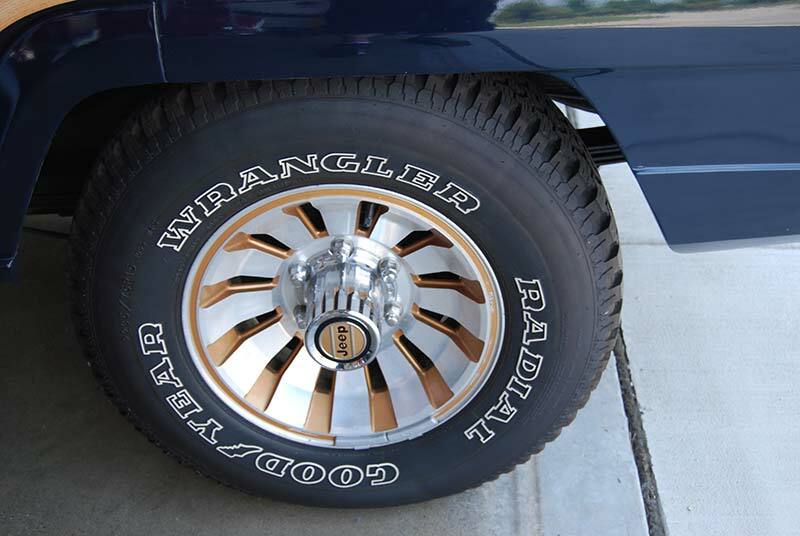 The 1987 Jeep Vehicle Identification Number (VIN) has 17 symbols. A typical VIN is 1JCNJ15U2HT081743 where the first three symbols indicate country of origin (1=United States), manufacturer (J=Jeep) and vehicle type (C=Wagon). The fourth symbol indicates the engine (N=5.9-liter V-8). The fifth symbol indicates the transmission type (J=automatic). The sixth and seventh symbols indicate the series and type of vehicle, which are the same as the model number 15. The eighth symbol U indicates the GVW rating. The ninth symbol is a check digit. The 10th symbol (a letter) indicates the model year (H=1987). The 11th symbol indicates the assembly plant (T-Toledo). The remaining numbers indicate the production number starting at 000001. ENGINE: Overhead valve. Cast iron block and head. Bore and stroke: 4.08 x 3.44 inches. 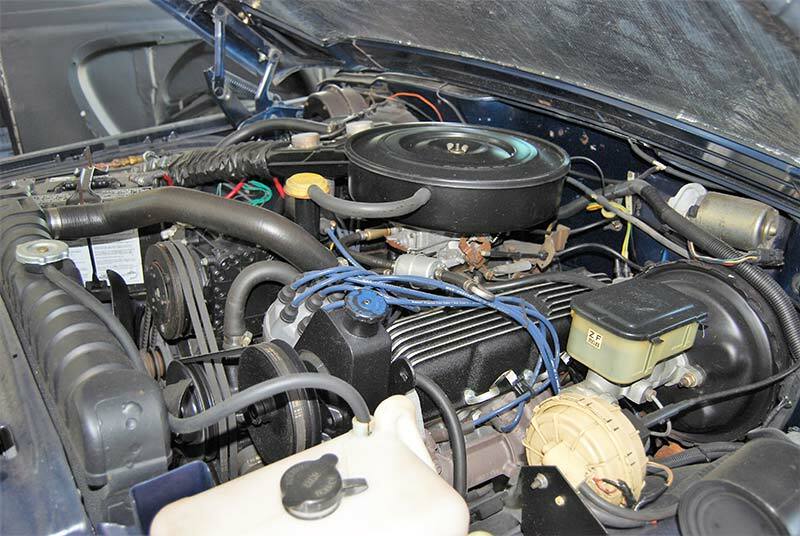 Displacement: 360 cubic inches. Brake horsepower: 144. 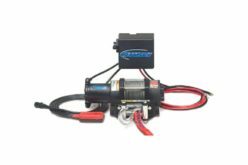 Hydraulic valve lifters. Carburetor: two-barrel. 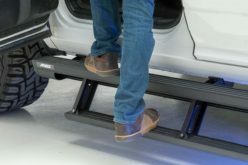 CHASSIS: Wheelbase: 108.7 inches. Overall length: 186.4 inches. Overall width: 74.8. Height: 66.4 in. inches. 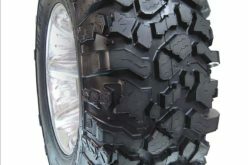 Tires: P225/75T15 white letter. 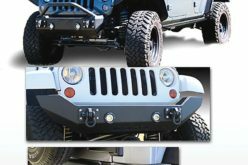 FACTORY OPTIONS: Front bumper guards. Dual outside rearview mirrors. 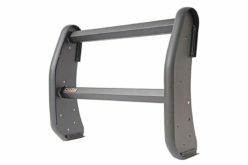 Rear bumper guards. Centre console. Heater and defroster. 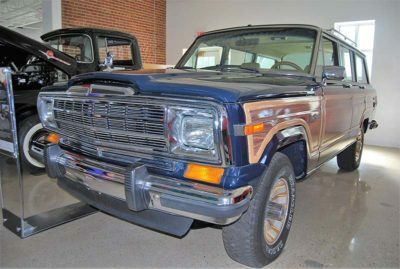 The luxuriously-equipped 25th Anniversary 1987 AMC Grand Wagoneer with 17,569 original miles is part of The Automobile Gallery Collection (www.TheAutomobileGallery.com) of Green Bay, Wisconsin. It was built in Toledo, Ohio and delivered to Milwaukee. Today, this well-kept Grand Wagoneer looks like a new vehicle and hardly shows its age of 31 years. 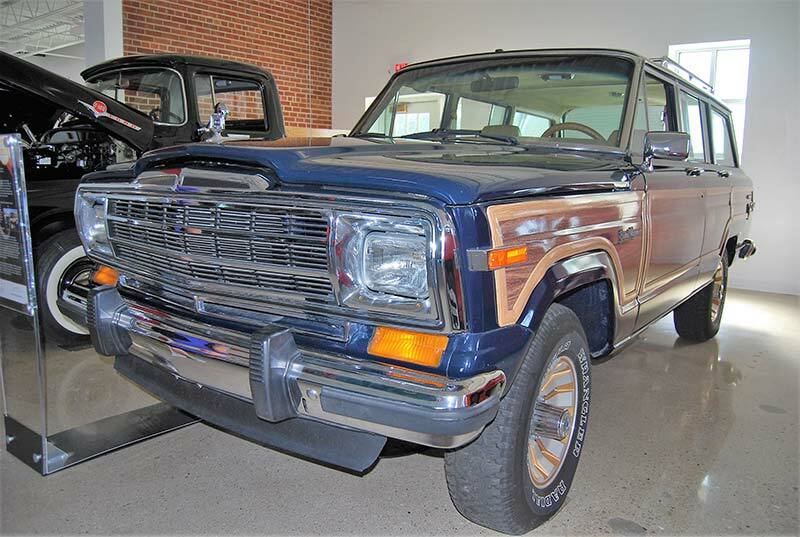 It’s a fabulous example of this classic 4×4 luxury truck.